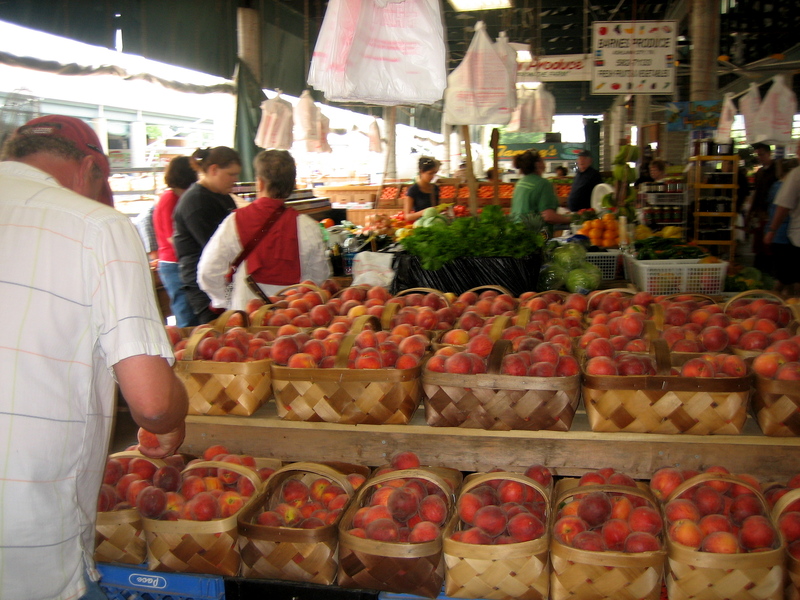 Yes, these are peaches at the Nashville Farmer’s Market, not cherries or berries, but you could make a pie out of peaches and besides it isn’t really about pies, “pie-in-the-sky” is a metaphor and this is about blogging. I’m starting a whole new blogging chapter. Let me start by saying that I cook WAY more often, and make a lot more variety of foods than I’ve been posting on my blog. Yesterday for example, I baked a vegetable pie with whole-wheat crust, stuffed with grated onion, zucchini, carrots, potatoes, mozzarella, romano & italian herbs. I had mixed up an extra crust to keep in the fridge to use later in the week. Then the crust when we tasted the vegetable pie was sooo delectable that listening to me talk about making a fruit pie out of it made Ken impossibly impatient to taste that fruity goodness right now. So I got right at it and baked a cute miniature cherry-blueberry-strawberry pie that was so delicious even poetry couldn’t describe that pie. I’ve decided I’m not going to spend my life trying to write the perfect description of a slice of pie. There is another slice of pie in the refrigerator and I’d rather eat pie than blog about how it tasted. And there’s more flour in the cupboard and I’d rather bake chocolate chip cookies than take pictures of them. So what shall I blog about? Must I blog? Probably I should. I am a writer and it’s 2012. Besides, I can’t stop writing. I write every day so why not blog? Except I tend to get too hung up with making my blog so perfectly right that it takes way too much of my time, so I guess I don’t yet really understand what a blog is supposed to be and do. Let me be honest. I started blogging because my memoir is coming out soon and all the PR people in the whole world all say I must have a blog. But I refuse to write a blog that basically only begs people to buy my books. So enough of that. Now what shall I write? I’ve been blogging my recipes because I’m married to a chef and we’re both good cooks. I could give you my pie crust recipe because I’m really good at making pie crust but big deal. I mean, really, the world does not need another pie crust recipe. (or as we say here in Tennessee, mah lil ole res-pea foh froo-it pah). So is all my time spent blogging just another doozy-whoppin’ piece of pie-in-the-sky? If I’m doing this to get rich and famous, then blogging is probably guaranteed to be nothing more than another way to fritter my life away. But I’m blogging because I’m seriously, really looking to connect with people who share my interests and values, people–near and far–who are writers, or passionate cooks, or creative people, or stuck in an uncooperative body afflicted by FMS, MS, RA or any other kind of dreary potentially disabling dumb thing, and all those who love their families and are grateful for friendships, who are positively happy to be alive despite everything. If you’re interested in real conversation and companionship (and you aren’t just trying to get me to buy something) let’s get to know each other better. I do respect your entrepreneurial spirit and your need to make a living, but as soon as it seems obvious that all I am to you is a target market at which you’re aiming, with an overly-inflated egotistical hope that I will be the duck that makes you materially wealthier, then you’re not likely to sell me anything anyway, so you’ll be wasting your time. But if you’re like me in thinking monetary gain isn’t the most important thing in the world, if you’re zanily-appreciative-of-all-the-little-but-truly-important-things such as friendship, then you’re one of the real honest-to-goodness people I’m looking to meet. Talk to me, do you want my recipe and secret tips for great pie crust? Or don’t you need it because you won the blue ribbon for the best pie crust at the state fair? Or do you have other priorities that are more important than pie crust and so you get yours from the freezer section at the grocery store or maybe you buy your pie already made from Baker’s Square? Who are you? What’s your favorite pie? And feel free to post a link to your blog or your favorite social networking site, please, and tell me and my friends why a nice person like you is blogging and what you hope to gain from social networking–as long as there’s a whole lot more to you than what you’re selling. Because if there isn’t, you might want to know that pie-in-the-sky is pretty hard to sell these days. I’m pretty sure I belong to the majority of buyers, the good old-fashioned people who want to meet the real deal, made from real down-to-earth virtuous fruit. WOW, you are doing quite some soul-searching there…this is the first post I read by you, was intrigued by the photo. And then this. Quite some food for thought, and probably the right questions you are asking there, too. So, you gave me what you care about in your post. Then write about that. If you really care about your pie crust and how good it is, then share it…it ,might be just what someone is looking for, despite the 3 million hits. It is all about our passions. Looking forward to where you are headed! Gruesse, Herr Winegetter–coincidentally I lived in Germany (Hamburg) and went to school there. Still speak the language fairly fluently, love the country, the people, the language and the wine. Have you tried Wiemar wines from the Finger Lakes region (New York)? The founder winemaker (a German) retired a couple of years ago, so I don’t know whether they’re as good as they used to be. Very German-like, and available here. I’ll be checking out your blog because we, too, love a good wine. I don’t know why the German wines are so difficult to get here. Maybe they just can’t produce enough of them to satisfy Europe and the U.S. ? Your reminder to blog about what I’m passionate about is a good one. I tend to over think things (the German philosopher in me comes out)… and, I have a lot of passions, so I’m afraid the blog might become too unfocused if I amble any which way. On the other hand, that might be what makes it interesting–the fact that between my husband and me, we have too many interests too count. I’ll see you on your blog! Thanks for posting. I sincerely value your response. Life is so funny sometimes…and so random, too. I see your blog on the dashboard, got intrigued by the photo, read the post, something got me to write back, and then it turns out you lived in Germany, speak the language, know a German winemaker in the US. Incredible! And what a treat. I am glad you have fond memories of Germany. I, for one, appreciate its beauty but do have my problems with some aspects of the “German character” (mainly the complaining part…). My wife is Alaskan, and I had spent considerable time in Kentucky since the mid-1990s before we moved to Michigan, so I do have some ideas on the notions of friendship. I have made some spectacularly good friends with Americans, so I do think deep and committed friendships are possible over here as well. But I know what you are talking about for sure. It can be hard to crack a German, but once you’re in, you’re in (btw, Koreans are even harder to crack, but my Korean friends are among my best!). On the wines: You can get good German wines over here, too (even spectacularly good ones), but it is hard to get everyday German wines. Also, as they are mostly completely underpriced in Germany, the high prices over here are even higher and more unacceptable. And that is not just customs and shipping that makes them that expensive. It is a wine culture based on Italian and French wines, which are expensive, and so the average wine drinker thinks good wine has to be expensive. Californian wineries that are often not as labor intensive as European wineries that have smaller vineyards etc., charge what you charge for an expensive European wine…it is frustrating. But also interesting and challenging. 🙂 Well, those are just my thoughts and I bet people disagree. Ah, so much for now. Dinner is calling! Thanks for replying right away. Am glad we got this conversations started. Thanks for that as well. Congratulations on your forthcoming memoir! When will it be out? Thanks. It’s supposed to be in bookstores this fall. It was a long, very long journey. Tell me about it! I wrote my memoir’s first chapter in 2000, and the book is coming out next spring. Have you blogged about your path to publication? I was working with a book marketing consultant and she said writers/would-be writers are interested in those types of stories. I’m going to try to write something soon along those lines. Rachael–the book is about my long path to publication (the usual one–years of writing, learning the craft and rewriting) and about being determined to be happy despite setbacks and hardships. As you know, the writing life is inseparable from one’s overall life, and I think the interest for us is that even though the details are unique, the story of a love-affair with words is universal, and complex. But there are many episodes and ideas that didn’t fit the story arc of my memoir (name: Toward Daylight–it’s about love, food, and starting a new life in New England with my chef/entrepreneur/husband while learning to live with contentment–and maintain a writing schedule–despite chronic and severe, incurable pain). So now you’ve given me an idea about one of the things I can blog about. I haven’t written much about how my relationships with other writers–through workshops, on-going critique groups, one-on-one friendships and mentoring (and now, developing through blogging) have been been invaluable to motivate me and inspired me to grow. Thank you! And congratulations on your book coming out, too! Hi Tracy! Loved this post and I love that you are asking these kinds of questions! I’d like to think that when people follow a blog it’s because they want to engage and get to know someone. Maybe they have found a like minded person – sometimes in “real” life that’s hard to find! For me blogging is a way to communicate and to connect with people who are similar to me. I love the friendships I’ve formed from blogging – from the encouragement or much needed advice…it’s been great! I write about food because I’m crazy about it and I write about other stuff because it’s whats going on with me at the time. Sometimes I feel I really need to say something – other times, I’m asking a question and need some advice or a new way of thinking about something. I think that the blogging community as a whole is divided into those who are selling and those who really just want to build friendships. I hope to be the latter – although if I ever got the chance to write and sell cookbooks I think I’d be in heaven! Anyways – I look forward to reading what’s coming next! And to checking out your memoir when it comes out! I think you’re right about the division between “sellers” and “relators.” I was a little bit surprised to see that it is even more apparent in the blogging-realm than in real life, to me at least, which kind of person I’m dealing with. Thanks for dropping by for a virtual visit. Maybe sometime we can share a cup of virtual tea. I like green or herbal (actually I like any kind as long as it’s good, and I like coffee, too.) Speaking of which, Ken is fixing me a cup right now… aren’t good husbands wonderful things? “I think it is easier to notice the difference between sellers and relators in the blogging world:”– I agree, and it surprises me. People talk about the lack of subtlety in e-conversation; the voice inflection, body language, emotional tone is missing. It hadn’t occurred to me that it would also take away a natural “schmoozers” ability to take people in by the sheer force of a pleasant persona. I have never believed in “progress” as an ideal or value (the prevalent notion of our society is progressive–innovations, new technologies, new everything–are valued because they’re new. On the other hand, I’m always in favor of change for the better. We’ve heard plenty of eulogies that the art of conversation is dying. It never will. There always have been the people whose interest in every relationship hinges on its personal advantage for them; there have always been people who are interested in building authentic friendships and making heart-to-heart or mind-to-mind connections. That the new technologies make it more immediately apparent who is in which group, astonished me. I think it’s definitely a time-saving and also a soul-protecting benefit (by soul, I mean the part of us that attaches itself through honest concern, for and to another person).